What was life like for children living in Malta in the 1950s? For starters, they had no pens. Children had to write with a quill dabbed in an ink pot. There were no computers, no tablets, no white boards. In the classrooms there were no tables and chairs, but stiff wooden benches. At about noon, the children would go back home for lunch and a siesta, and then return to school for more playtime and more lessons until 4pm. Today’s children can dip into the fascinating insight of the world of the 1950s through the popular classic tales of Pietru Pitravu. Created by author Carmel G. Cauchi, the endearing character first came to life in 1976 in the book Il-Bawxati ta’ Pietru Pitravu. This collection of 10 stories – narrating the pranks of a boy whose mischief knew no end – became such a hit that they were followed up by two more books: Iżjed Bawxati ta’ Pietru Pitravu (1977) and Bawxati Oħra ta’ Pietru Pitravu (1981). Today, 40 years on, the character is just as popular with children. For this reason, Merlin Publishers have published a new revised version of Bawxati Oħra ta’ Pietru Pitravu, which has long been out of print. The new edition carries new illustrations by Frank Schembri and is updated according to the new language format. The stories are based on 10-year-old Pietru, who lived in Malta in the 1950s. He earned his nickname Pitravu (beetroot) at school becuase he was always trying to skive any form of learning. He prefered to use his brains to come up with creative pranks. Cauchi is one of the most loved Maltese authors and his ability to write flowing stories in an impecabble style is appreciated by both the young and old. He is also the creator of two other popular characters in Maltese children’s literature: Betta Trombetta and Mastru Gerfex. 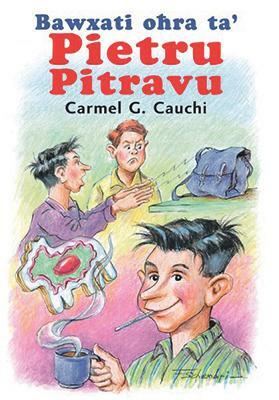 The Pietru Pitravu series, as well as other children’s books penned by Carmel G. Cauchi, can be found at all leading bookshops or directly from www.merlinpublishers.com.